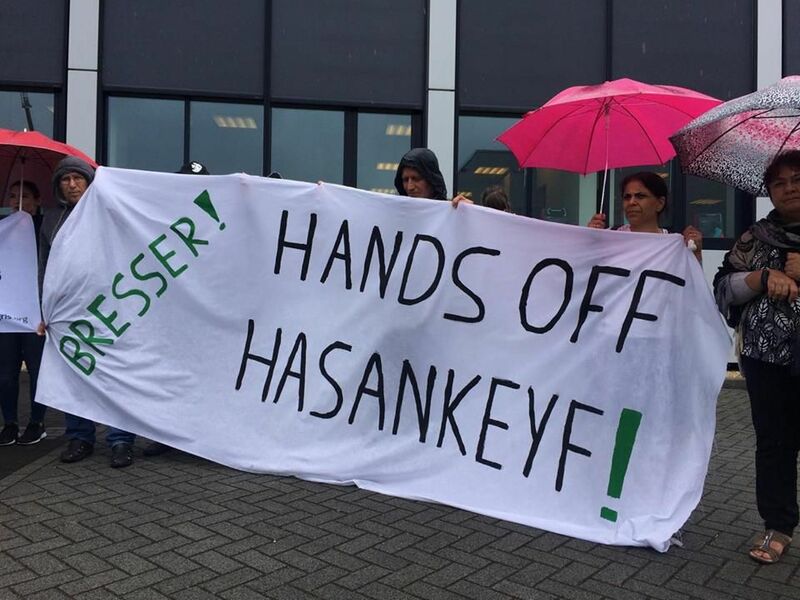 Today, several dozen people from Dutch, German, Iraqi, Iranian, British and Turkish civil society organizations are protesting at the headquarters of the Dutch company Bresser in s-Gravendeel, near Rotterdam. Bresser, which specializes in the relocation of buildings and monuments, is currently moving historical monuments in Hasankeyf, located in the mainly Kurdish populated South East of Turkey. The relocation is part of the highly controversial Ilisu dam project and we demand from Bresser to put an immediate stop to the relocation of the cultural sites. Hasankeyf is a 12,000 year old settlement at the Tigris River with unique cultural and natural heritage, and is currently threatened by the construction of the mega Ilisu Dam. The dam under construction would create, if completed and implemented as planned, a social, cultural and ecological disaster in the region, impacting not only Turkey but the Tigris basin in Iran and Iraq. The local population and Turkish as well as international environmental and human rights groups vehemently reject the project, which will lead to serious human rights violations. To make way for the dam, a small number of ancient monuments will be relocated outside the planned dam reservoir close to the new settlement of “New-Hasankeyf”. Bresser’s involvement was central to the relocation of the 550 year old and unique tomb of Zeynel Bey in May 2017. And now the Dutch company, together with the Turkish company Er-Bu, is planning the relocation of five further monuments, including the Middle Gate (to the castle), a mausoleum, a bath and a social complex. Works are planned to start in late summer 2017. In a later step, three other monuments (among them the famous El Rizk Mosque) are planned to be relocated. Their relocation would be an unforgivable act of cultural heritage destruction and a violation of the human rights of the local people, and facilitate far-reaching and irreversible impacts along the Tigris basin. The protestors criticize the uncritical and persistent involvement of Bresser in this project, which is in violation of Turkish law and international conventions. The contracting of the project also took part in secret outside of public scrutiny. The relocation of The Zeynel Bey Tomb is an active violation of the Convention for the Protection of the Architectural Heritage of Europe (CETS 121) which both Turkey and the Netherlands have signed, and also an infringement of the Human Right to Cultural Heritage. Bresser reacted to the coalition’s requests only after the campaign contacted the Dutch government. There was no effort to consult civil society organizations or the local population impacted by the relocations. Bresser rejects all responsibility, whilst it is clear that without the company’s involvement, it would be almost impossible for the Turkish Er-Bu and the Turkish government to relocate the monuments. Due to the company’s failure to conduct due diligence on human rights impacts, and the evident lack of respect for human right to culture, a number of civil society organizations will soon lodge a complaint against Bresser for violation of the OECD Guidelines for multinational enterprises. It is not too late for Bresser to withdraw from the relocation process. If Bresser continues with the relocations, however, the company will be guilty of destroying the oldest cultural heritage in Mesopotamia and make way for a mega dam that will destroy not only cultural sites but vital biodiversity in the region.